Model: HP ProLiant DL380e Gen8, HP DL380e G8, Storage server. The HP ProLiant DL380e Gen8 sets the next generation standards of 2U 2-socket rack servers for the industry. Form Factor: Rack-Mountable 2U. Server Spec. HDD: 2 x Internal Bay Mounts with 1 x 120GB OS HDD 1 x 1TB WD RE Enterprise 7200Rpm HDD Installed. Integrated RAID 0, 1, 1E, and 10. 2 x RJ45 Gigabit ethernet. HP Smart Array P420 Raid card with 1GB FBWC module. 2 x 300GB SAS HDD's. HP Proliant ML310 G8. HP RDX backup drive. This system has been thoroughly tested by our professional technicians and is in full working order. 2 x 2.80GHZ ( X5560 ). WHAT'SNOT INCLUDED: - Hard drive and caddies / Outer Rails / Cables / Accessories / Software etc. WHAT'S INCLUDED: - Server ONLY. TESTING: - Powers up to BIOS fine without any errors or passwords. Fans run fine. Dell Poweredge R510. Single 2.26 Xeon. No Hard Drives. No Accessories. 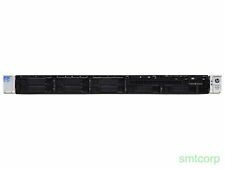 Dell PowerEdge R230 1U Rackmount Server, Intel Core i3 6100 3.7GHz, 4GB DDR4 RAM. Condition is Seller refurbished. Dispatched with Other 48h Courier. DELL PowerEdge T310 - Xeon X3460 2.8GHz - 4GB DDR3 - PERC 6/i RAID - IBM Ultrium LTO3 - Server. Xeon X3460 Quad Core @ 2.8GHz. IBM Ultrium LTO3 tape drive. DELL PowerEdge T310. The PowerEdge T30 can help you - Hard Drive: 1 x 1TB SATA. - RAM Installed: 8GB DDR4 SDRAM. Expand flexibly with four PCI/PCIe slots that allow you to grow at your own pace. Upon receipt of your order you will be asked to sign for the goods received in good condition. Dell PowerEdge T420. Model – PowerEdge T420. Cpu Config – Xeon E5-2420 6-Core 1.90GHz. Hard Drive Format – 4x 1TB SATA., 1000% Happy With Item. Great service. Quickly resolved 1 small issue. Thx -R1dxn. 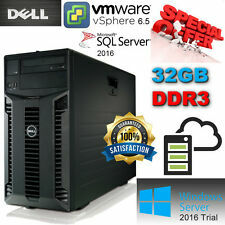 Dell PowerEdge R210 Server (L3426 Quad Core HT, 8GB RAM, iDRAC Express) . Condition is Seller refurbished. Dispatched with Other Courier (3 to 5 days). Condition - Used, Rack Rash but nothing that affects functionality. More details to follow. Lenovo Thinkserver RD330. 4x 1TB SATA. Lenovo Think Server. 16GB RAM (2x 8GB DDR3). 100% Genuine. Smoothwall S8 Server. The hard drives have been removed. Location Reference: 263C. This is aGrade 3item. Power lead included. The HP ProLiant DL380e Gen8 sets the next generation standards of 2U 2-socket rack servers for the industry. Model: HP ProLiant DL380e G8, DL380p Gen8, HP DL380p, Storage Server. HDD: 14 x 3.5" (LFF) SAS/SATA Drive Bays - Caddies/Drives/Drive Blanks Not Included(Only 4x Bays Usable Without Add-in Card, Only SATA Drives Accepted Without Added in SAS Card). DELL PowerEdge R210 II. Ultra-compact Rack Server. Cleaned tested and in full working order. Front panel not included. Model: Dell PowerEdge R510. RAM: 16GB DDR3 RAM. Rails: No Rails Included. All of our servers are refurbished to a very high standard. Internal parts (such as RAM and CPUs) are tested individually, and once the components are installed the system is tested in full. Here I have for sale one HP Gen8 Microserver. HP Gen8 Microserver. 500 GB Samsung SSD (Boot drive). 16GB DDR3 ECC Ram (2 x 8GB). The server is in good working order. Windows 10 Pro X64 is installed as boot OS but this can obviously be changed by the end user. For data-centre deployed applications such as VMware ESXi and Citrix XenServer virtualization, there is no better choice than the HP ProLiant DL380 G7. RAID: HP Smart Array P410 ZM. Model: HP ProLiant DL380 G7. For Sale is a HPE ProLiant ML110 Gen9 Server. 16GB Genuine HPE 2133 RAM. Dedicated iLO Port Option Kit. This Server is the 8 x 2.5" / Small Form Factor model (SFF) and contains 2 x 600GB 10K SAS Hard Drives. 10.8TB RAID STORAGE. 500 GB HDD RUNNING OS. CUSTOM BUILT SERVER UNIT. INCLUDES UNIT AND POWER LEAD. Here I have for sale one HP Gen8 Microserver. HP Gen8 Microserver. 480 GB Sandisk SSD (Boot drive). 16GB DDR3 ECC Ram (2 x 8GB). The server is in good working order. Windows 10 Pro X64 is installed as boot OS but this can obviously be changed by the end user. The HP ProLiant DL380e Gen8 sets the next generation standards of 2U 2-socket rack servers for the industry. 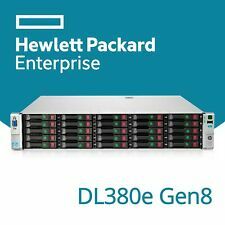 Model: HP ProLiant DL380e Gen8, 14 x LFF, DL380p Gen8. HDD: 14 x 3.5" (LFF) SAS/SATA Drive Bays - Caddies/Drives/Drive Blanks Not Included(Only 4x Bays Usable Without Add-in Card, Only SATA Drives Accepted Without Added in SAS Card). PowerEdge T20 (PowerEdge T20). Model: PowerEdge T20 (PowerEdge T20). Storage type SATA 2 x 1TB 3.5" SATA. Make: Dell Inc. 100% Tested. Overall a really nice system. Quick Guide. All systems are checked and tested prior to dispatch. HP Proliant DL360 G5 - 2x Xeon E5420 QC 2.5GHz - 16GB. HP ML350e Gen 8 for sale. 4x3.5" hard drive slots available, 2x 1TB HP Hard Drives installed as a Raid Mirror. DELL PowerEdge R610 Rack Server. Tested with VMWARE ESXI 6.7 / 6.0 / 6.5 Windows 2016 / windows 2019. Storage: 2 x 146GB 10 K SAS Drives (Takes up to SIX) . Backplane: 1x 6 Bay 2.5” SFF SATA /SAS /SSD. This is my old VMware lab server, bought from Dell around 3 years ago. I have upgraded with 4 sticks of Crucial 8GB DDR3L-1600 UDIMM ( CT102464BD160B). The original 4GB stick is included. You are getting the server ONLY, no other cables or accessories. HP ProLiant N54L Microserver.Upgraded to 6GB of RAM. RAM Size 6GB. Number of USB 2.0 Ports 6. Item Weight 8.12 Kg. HPE Proliant ML110 G7. 1 x 250GB HDD. 1x Xeon E5606 processor. 5x 500GB SATA drives. HP ML350 G6 tower server. AMD Turion II Dual core processor 1500MHz. No Hard Drives, No CD /DVD Drive, this has recentley been removed from use, was used for a project but no longer required. 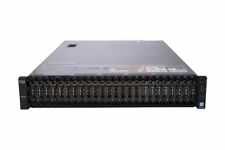 Supermicro SC512L chassis with sliding rails. 1x 250GB SATA disks. Here I have for sale a Supermicro 1U server comprising of the following specification 2GB DDR2 RAM. CPU Details:-. CPU Temp: 82.0. CPU AMD Turion II Neo N40L / 1.5 GHz. Type Server. Server Scalability 1-way. OS Certified Microsoft Windows Server,Red Hat Enterprise Linux. Power Provided 150 Watt. Depth 26 cm. Width 21 cm. Service & Support 1 year warranty. Was so good have replaced with another HP MicroServer (with more disk space). 2x E5-2609 Processors @ 2.4GHz. 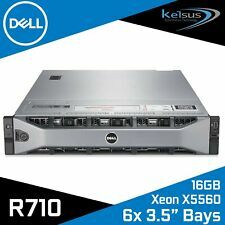 =-= Dell Poweredge R430 Server 1x 6 Core Xeon E5-2620 v3 2.4GHz 16GB DDR4 =-=. Audio/Mic combo. Sound & VGA Ports. 2x Network 1000/100/10 port.